Known since the mid-1800s, jelly rolls are cakes made of a thin sheet of sponge cake, spread with jam or jelly (and sometimes whipped cream or frosting) and rolled up. This type of cake is traditionally sprinkled with confectioners' sugar, rather than being frosted. When cut, jelly rolls have an attractive pinwheel design. The British term for jelly roll is Swiss roll. 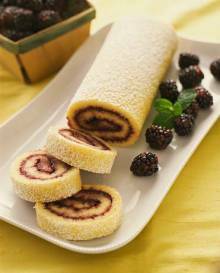 What is a Jelly Roll or Swiss Roll Pan? A rectangular baking pan with about 1-inch-deep sides used to make sheet cakes or sponge cakes used for jelly rolls. These pans are usually 15 x 10 x 1- inch (38cm x 25cm x 2.5cm); however there is a smaller pan measuring 12 x 7 x 3/4-inch and a larger one measuring 17 x 11 x 1-inch. 1. Preheat oven to 375 degrees F/190 degrees C. Grease and lightly flour a 15 x 10 x 1-inch (38cm x 25cm x 2.5cm) jelly roll (swiss roll tin) pan. 2. Separate eggs. Allow egg whites and yolks to stand at room temperature for 30 minutes. Stir together flour and baking powder; set aside. 3. In a medium mixing bowl beat egg yolks and vanilla with an electric mixer on high speed for 5 minutes or until thick and lemon colored. Gradually add the 1/3 cup granulated sugar, beating on high speed until sugar is almost dissolved. 4. Thoroughly wash the beaters. In another bowl beat egg whites on medium speed until soft peaks form (tips curl). Gradually add the 1/2 cup granulated sugar, beating until stiff peaks form (tips stand straight). Fold egg yolk mixture into beaten egg whites. Sprinkle flour mixture over egg mixture; fold in gently just until combined. Spread batter evenly in the prepared pan. 5. Bake in preheated oven for 12 to 15 minutes or until cake springs back when lightly touched. Immediately loosen edges of cake from pan and turn cake out onto a towel sprinkled with confectioners' sugar. Roll up towel and cake into a spiral starting from one of the cake's short sides. Cool on a wire rack. Unroll cake; remove towel. Spread cake with jelly or jam to within 1 inch of edges. Roll up cake. I'd like to know if you have recipes for the larger jelly roll pan (17 x 11 x 1-inch) because that's the only jelly roll pan I was able to find. Or can you give me a tip on how to adapt the standard jelly roll pan recipes to my 17 x 11 x 1-inch pan? This looks so good. I would like to try several of your recipes. Thanks. Very, very simple. Fast. Turns out great. Excellent for beginners or those needing an impromptu dessert. Parchment paper might help you turn the cake out more easily if you're a first-time jelly roll baker. Tip: there is so little dry ingredient in this recipe, and it is only folded in gently, that unless you make sure your Tsp of baking powder is totally lump-free, you can end up with an icky bite of cake.